To start a distilling run, founder Henry Wathen mashed in his small tubs with water and relied on “spontaneous” fermentation. This is interesting as it suggests a natural ferment could be achieved without backset (say as lambic is made today). However, as soon as backset – the spent residue in the still – was available from the first boils, that was brought to each successive tub in four- gallon buckets and used to mash. For fermentation, as soon as they had top yeast from the fermenter, they used that – this is yeasting-back, the alternate way to sour-mash. Also, Henry Wathen used all-corn according to this account. To ensure conversion, part was malted on the property. He used two copper stills, a wash and spirit still, just as in Scotland to this day for malt whisky. With each generation, improvements and changes occurred. The wash still was replaced with a hollowed log still, then a wood two-chamber still, then a wood three-chamber still. This still is a kind of transition between a pot still and a continuous still divided by plates through which steam surges and continually re-distills the mash. As I glean it, a three-chambered still is really a batch system, like three pot stills side-by-side except except each chamber is placed atop each other and there is no external condensation and re-charge. In effect a triple distillation occurs. They were used into the 1900s but became obsolete after Prohibition. Other successive changes: the copper spirit still becomes replaced by a horizontal copper doubler, similar to the ones seen today. And finally, a metal, multi-tiered column still, quite similar to those today, replaces the wood three-chamber still. The account implies the spirit improved with each such change and I think I agree with that. My only experience with pot stills and bourbon is Woodford Reserve’s bourbon. The pot still element of its bourbon is very strong-tasting, at least at four or five years old, vs. column distillate of the same age; I prefer the latter and I think the market probably did in the 1800s, too. Other changes: barley malt replaced corn malt about 1850, for two reasons: it was made by professional maltsters and more reliable, second, it made the whiskey taste better. This ties in to some other accounts, e.g., distiller Charlie Thomason from Willett of Bardstown, KY said c. 1960 that much modern bourbon has reduced the amount of barley malt formerly used, to the detriment of flavour. (I will show later that in general a greater amount of barley malt was used in bourbon production c. 1900 than today). One of the Wathen descendants ensured steam-heating of his warehouse to accelerate maturation and produce again a better product, this is later in the 1800s. Finally, about 1870, a purpose-made yeast replaces yeasting-back. This would have been a hop yeast, cultured up before labs isolated a pure-culture yeast. In a word, jug yeast. This account from the same era as the article mentioned describes its preparation. 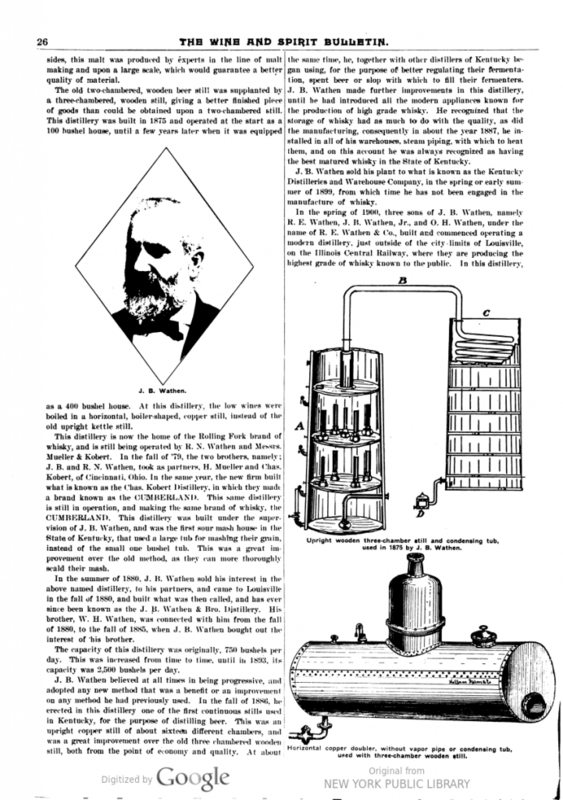 Just as an index of its modernity, as late as 1905 you find ads for whiskey proudly advertising “no jug yeast”. It appears – this from another account – that the hops neutralized the “bad” organisms to allow the selected yeast to do its work. One can infer the Kentucky distillers’ practice of yeast-making probably is not age-old and developed from the mid-century, but further substantiation would be needed. The best part of the article is, detailed illustrations show how each item mentioned worked. E.g., the famous log still, an early steam-operated affair made from two hollowed poplar logs, is shown. They were arrayed horizontally on each other, not end to end, which suggests this was a batch-type system, more primitive than the wood two-chamber still but similar in principle. Allowing for some commercial puffery as any article of this type would have, it is still a remarkable account of technological evolution in bourbon production as practiced by one family over time, the sons working with fathers and then improving in their turn as warranted. One interesting thing, finally. I don’t think the article mentions the word bourbon once. The operative word is whiskey and this characterized George Washburne’s Wine and Spirit Bulletin in general. 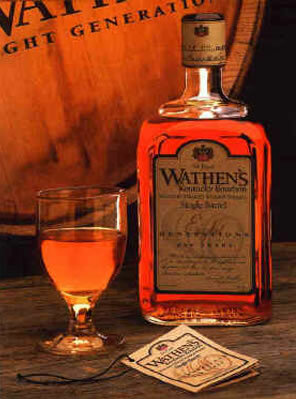 The word bourbon often appears in the brand names listed, which is many times, but not too often in the textual narrative. I think this suggests bourbon initially was a retail and wholesale trade term, applied from the beginning from the outside so to speak and literally probably outside Kentucky (in New Orleans, Cincinnati, Chicago, etc.). The Kentucky pros called it whiskey – and lots of them still do.